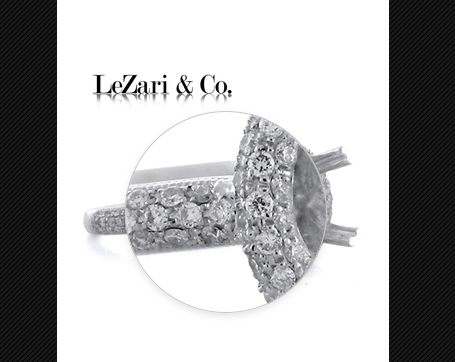 Pave vs. Micro Pave - LeZari & Co.
A diamond ring's setting style is as important as choosing a diamond cut, shape and size. Familiarizing ourselves with different setting styles will help make the best decision for a center stone and the overall look of the engagement ring. Pave and Micro pavé continues to be a very popular diamond setting style for engagement pieces however there is a slight difference between the two. The term Pavé is a french word pronounced as (pah-vay) referring to a surface setting of small gemstones. 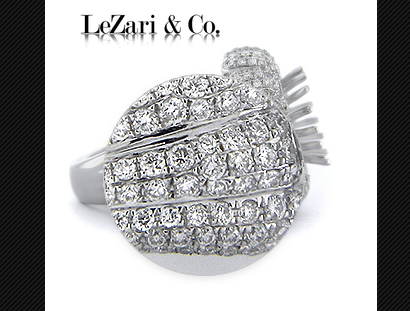 The pave setting consists of small beads to fit in between each gem stone creating a honey comb like pattern. This styles french term traces back to the cobble stone setting design that originated from England's ancient road construction. Diamonds are set in a very similar pattern to cobble stones covering a flat surface. The advantage of this diamond setting is that different stone sizes can be used in this pattern as opposed to the Micro Pavé setting style that requires uniform stone sizes. Micro Pavé is also an excellent option for a ring semi-mount however it's design requires delicate materials and strong gemstone craftsmanship. The sizes of these stones are typically smaller than the diamonds set when creating a Pavé design. Micro pavé diamonds are also referred to as Melee, which are diamond cut weights about 0.015ct. and lighter. This comparison is used to emphasize the delicacy and miniature presentation of micro pavé gems. The overall look exhibits a clean surface of shiny diamonds. There are no wall separations in between which is how these neat rows of stones are formed. A few similar terms used to describe Micro Pavé is Microscopic setting or Micro set. Overall both designs require important techniques along with specialized tools, high magnification, and seasoned stone setting practice. The pavé setting displays a sparkling look that remains subtle and elegant, it's simplicity makes an excellent base for a brilliant center stone. 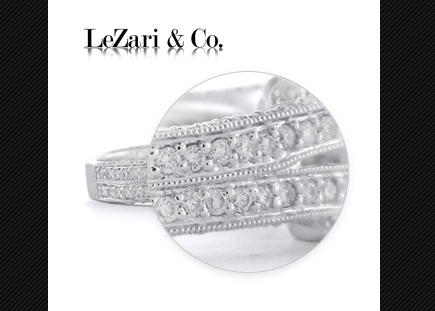 Here are a few examples of Pavé & Micro Pavé setting designs from LeZari & Co.'s Engagement Ring collection.